There has been so much going on in the sport of boxing, especially in the month of September alone. September 8th set the stage for a pretty excellent welterweight clash between former champions Shawn Porter and Danny Garcia. After 12 rounds of action, it was Porter who came away with the WBC welterweight title after a great test from Garcia. And this past weekend, Las Vegas was again the host of the epic rematch between Saul Alvarez and Gennady Golovkin, which took place on HBO pay per view from the T-Mobile Arena. The rematch didn’t disappoint, as Alvarez came away with a majority decision verdict after 12 tough rounds, by scores of 115-113 twice and 114-114. Now the stage shifts to reigning IBF/WBA/WBO heavyweight champion Anthony Joshua, who will be defending his titles this coming weekend vs. Former champion Alexander Povetkin, from the Wembley Stadium in London. 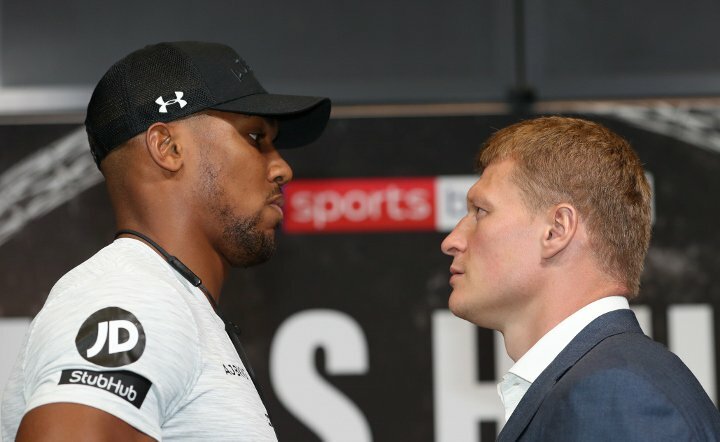 Joshua vs. Povetkin will air exclusively on DAZN, the streaming network that Joshua’s promoter Eddie Hearn recently cut a monstrous deal with. To many, this fight isn’t about the 28-year old champion more than it is over his 39-year old foe. Povetkin is known best these days for having failed two drug tests within a one year period. First Povetkin tested positive for the endurance-enhancing drug meldonium ahead of a potential fight with Deontay Wilder and later came up positive for the muscle-building drug ostarine prior to a schedule matchup with Bermane Stiverne. For this fight against Joshua, however, Hearn insists the Russian has been heavily tested throughout his 12-week training camp in an effort to prove he is a clean fighter. Hearn spoke recently with the Daily Star about this weekend’s big fight. Hearn revealed there will be further tests for the former champion upon his arrival to the UK. Hearn also believes that Povetkin has a lot of pride heading into the matchup.